Again she vanished but I proceeded over and over and until I could reach her. 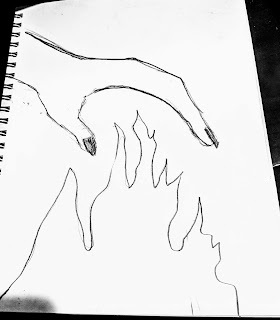 On the sixth attempt, I was able to grasp her hand and pull it from the flame. But when I did, I felt a strong burning sensation. I let go and she slowly turned her head. Her screams stopped, and she lifted her veil. Her eyes shrouded in dark makeup. Her lips were black, and her skin pale. I held my own hand in pain as she looked at me with silence. I then asked who she was. She gave no response. I asked why she was doing what she was doing to herself. She then spoke to me in soft whimpering voice. "I do this for I want nothing to do with myself. My own skin crawls with regret and resentment. I am uncomfortable. Covered in scars of failure and mistakes like a soldier maddened by war." Upon hearing her words my heart became overwhelmed with grief. I could see sadness billow from her eyes. Tears froze to her cheeks like crystals, eventually falling to the ground and shattering. 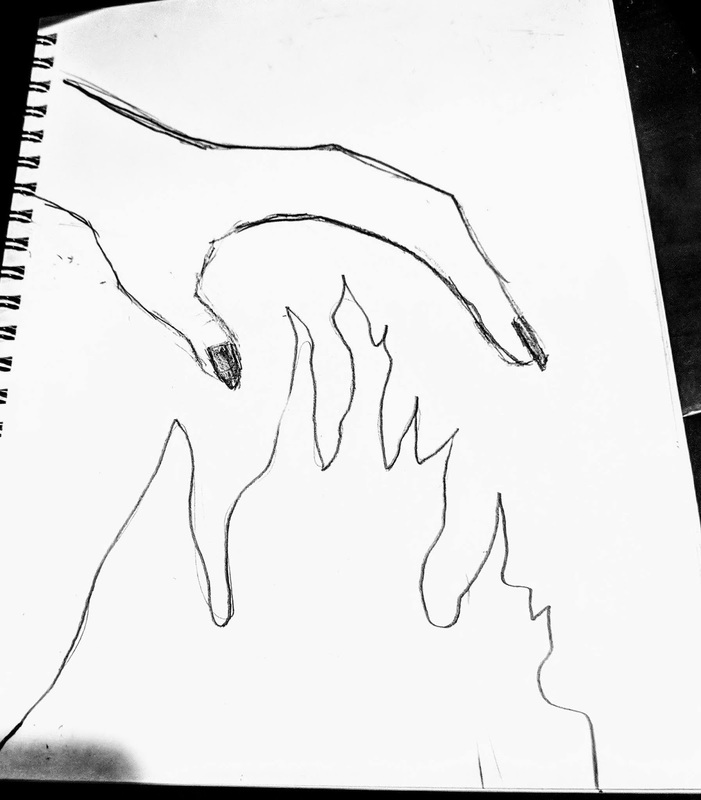 I then felt my burning hand become grasped by a feel of relief. I asked no questions but leaped to the opportunity to say a few words of my own. "I know not of who you are or where you came from. Or why you haunt these woods with a sorrowed heart. But from my travels a human and the errors in my way; I found there is no way through life without mistakes. Without failure, but there is ways through it without regret. Even if regret has already strained your soul. Each day we have eyes upon our soul, is another day we can achieve who we are. We can create new words new stories. We are all blemished in scars and wicked things. We are all made of riddled choices and pain. But we also have the opportunity to continue. To love ourselves and as we wish. We are imperfectly perfect and only fall short of ourselves when we decide to quit. And you my dear, appear young, you have much youth on your side and more time than I to live. So take back your skin, stretch it if you must. Make it yours and learn to not be the designer of your pain, but the curator of your hope, of faith." "Thank you, may you find your way home." And she vanished once again. But the days to come, the forest remained silent. Do you ever feel uncomfortable in your own skin? Do you ever feel it would be best to leave it all behind and run? What are your thoughts on regret and mistakes?